Keith Samuel, husband of Fiona (Cameron) Samuel, recently received his Canadian Citizenship at a ceremony in Charlottetown. Keith is originally from Annan in Dumfries & Galloway, Scotland, UK. He came over to Quebec to study French for a few months on a student visa. When the course finished, he decided that he wanted to see more of Canada, so he did research online and found out about WWOOF (World Wide Opportunities on Organic Farms or Willing Workers on Organic Farms). He applied at a few different farms across Canada, and the first one to get back to him was a farm owner in PEI. Once Keith arrived, he learned that the owners had a farm and also two hotels, The Great George Hotel in Charlottetown and Stanhope Beach Resort. He had a worked in a hotel in Gretna Green, Scotland, for 15 years before coming to Canada, so they offered him a job at the resort in Stanhope for the summer. When the summer season was over, he went on to the work at The Hotel on Pownal, formerly The Islander. Now Keith is the General Manager of this hotel. As they say, the rest is history. He has been here six years now. He likes how laid back and easy-going everyone is. The weather is different from Scotland; they don’t have too much snow or very cold temperatures. He said that when he arrived in PEI, he almost immediately realized how small the Island was and how everyone seems to know everyone. His Canadian citizenship test included questions on government and structure, rights and responsibilities of being a Canadian citizen, history of Canada and trade. It sounds, Keith, like you could teach the rest of born-and-bred Canadians a few things. When his family back home asks him about Canada, he tells them it is beautiful with great places to visit and the people are friendly. He does have to remind them that Canada is the second largest country in the world and you can’t drive from Charlottetown to Calgary in a day. “I just love it here, ” Keith says. Well, we can see why. 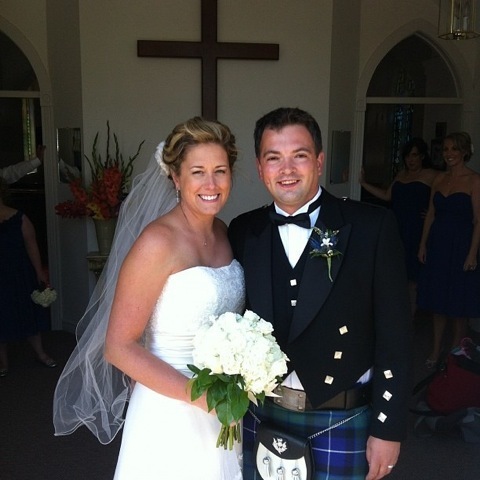 He was lucky enough to find a beautiful Clyde River bride, Fiona Cameron Samuel. They were married at the Clyde River Presbyterian Church last summer. Fiona attended the citizenship ceremony along with her husband. “It was a wonderful experience to be able to attend the ceremony and to see how happy and excited all the new Canadians were,” she said. Fiona and Keith Samuel reside in Clyde River. We wish you both many happy Canadian years.